You see, there are just too many things that will influence a project’s cost. From basic construction issues, such as repairing what may need repairs, to client selections for cabinets, appliances and everything else, to whether or not we plan on moving things around or adding space, there are so many variables that come into play. Let’s take a look at three kitchens, all remodels. The first we’ll call basic, but it’s anything but. The second is a little more upscale, and the third is high style. If these were cars, they’d be economy, full-size and luxury. This kitchen remodel is proof that basic doesn’t mean boring. The colors, sense of fun and attention to detail all contribute to a kitchen that is a joy to use. 1. The same structure as your current kitchen. By keeping the appliances and fixtures in the same locations and keeping the space intact, there’s little need to redo plumbing and electrical work. 2. Simple lighting. Sure, all those recessed lights might be nice, but light fixtures like the ones shown here will illuminate the space efficiently and inexpensively (each recessed light will typically hold only a 60-watt bulb, whereas a decorative fixture can have 120, 180 or even more total watts). This is a no-brainer when the lighting works with the design, as it does here. 3. Basic appliances. No built-in appliances, warming drawers, wine coolers, microwave drawers and so on. 4. Ceramic tile backsplash and vinyl flooring. Whether it’s the backsplash, flooring or other surfaces, using basic and inexpensive materials will help you keep costs down. Simple and straightforward white ceramic tile works well for the backsplash, and a vinyl tile floor can make a real design statement. If you don’t like it or don’t have the budget for ceramic tile, try using a simple laminate 4-inch tall backsplash and paint the rest. Just use a durable, easy-to-clean paint. And for the floor, try sheet goods such as linoleum. 5. Refinished cabinetry. Keep your costs down by reusing the existing cabinets. Maybe some refinishing or new doors or a few new cabinets are all that you need to get the function and style you’re looking for. Survey your existing cabinets to determine their condition, size and whether it makes sense for them to be refinished. After all, it wouldn’t make sense to refinish or put new doors on cabinet boxes that were damaged beyond simple repair. 6. Stylish details. With touches such as glass at the cabinet doors, you can incorporate a lot of style at a minimal cost. 7. Laminate counters. Laminates have developed quite a bit over the past few years. With better edge designs and photo printing, it’s easy to save the money and use laminate. And dressing up the edge is one really nice and inexpensive way to make a laminate counter shine. Another low-cost option for a countertop is ceramic tile, especially if you do the installation yourself. What if the existing kitchen layout doesn’t work? Maybe you want more space because you really love to bake and want a place to roll and cut out all those holiday cookies. Or a a kitchen island is something you’ve always wanted so that friends and family can sit nearby as you display your culinary skills. 1. A total rework of the space. Everything, including the kitchen sink, may need to be moved, which means new plumbing, electrical, air ducts and so on. 2. Professional-style appliances. From the 48-inch built-in stainless steel refrigerator to the 48-inch cooktop with grille and griddle to the 30-inch double convection ovens, this kitchen is all about creating wonderful meals. 3. Custom island. And if you want an island, why not make it like some large piece of furniture with legs and beadboard? It’s a perfect place for the kids to sit and do homework while the evening meal is being prepared. 4. Custom cabinetry. Beaded, inset doors of clear alder with a custom stain and glaze in nonstandard sizes with all the accessories make for a beautiful and functional kitchen at a cost. 5. Designer hardware. Forget about using big-box knobs and handles. Take the time to find the pieces that are special. After all, you will be using these things constantly. 6. Wood flooring. Wood or porcelain tile or a stone floor will be more costly than a vinyl tile or sheet. 7. Stone counters and a glass tile backsplash. A quartz or natural stone material such as granite will certainly be more costly than a laminate top. For some, the look and feel of these materials is worth the extra cost. And while laminate may start to look used and nicked up in a few years, stone will be fresh and new looking for years, even decades, after first being installed. 8. Custom storage. With custom cabinets, you don’t have to settle for what’s stocked. So if you want a cabinet designed to handle small appliances with drop-down doors that become extra counter space, custom is the only way to go. If custom cabinetry, built-in refrigeration and a La Cornue range are all must-haves, you’re talking high style and the price tag that goes with it. This kitchen is for real cooks. It would be a shame to be surrounded by all this gorgeous stuff and not use it. 1. A total rework of the space. Just as with the mid- to upper-range kitchen, don’t be surprised if everything, including the kitchen sink, gets moved, which means new plumbing, electrical, air ducts and so on. Often, you are gutting the space and starting from scratch. 2. Architectural consistency. A tall ceiling with beadboard finish, crown moldings, leaded glass windows, authentic baseboard and casing, plus other architectural details ensure that the kitchen space will visually connect with and feel like a part of the rest of the house after the remodeling is done. 3. Rich materials and accessories. Wood floors, stone counters, a chandelier and an Oiental rug will all contribute to the high-end style and elegance you’re after. 4. Custom cabinetry throughout. Well-made, well-crafted and beautifully finished cabinetry in custom sizes will make your kitchen uniquely yours. 5. A stove and hood that a French chef would be proud of. Sure it’s the cost of a small (or even a large) BMW, but why not? This stove by La Cornue, hand assembled and custom built to an owner’s specification, has style, beauty and function all in one. 6. Stone mosaic backsplash. Reinforce the special nature of the cooking area with a backsplash that draws attention to it. 7. Furniture style. From the tablelike island to the feet on the sink base, these details let you know that the cabinetry doesn’t have to look like cabinetry. Of course, we still want all of the accessories that make the cabinetry efficient, but that’s on the inside. So let’s make the exterior appropriate to the style and age of the surrounding house. 8. Built-in appliances that hide behind wood doors. 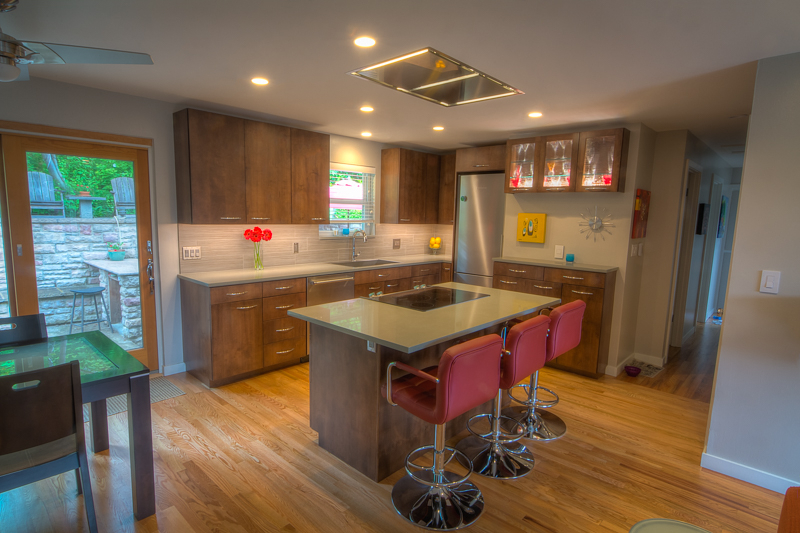 Custom wood panels that match the cabinetry conceal the bigger appliances. 9. Beautiful details. A farmhouse-style sink and a faucet that looks as if it could have been original to the house all add to the period charm. And the edge of the stone counter makes for an elegant top. Of course you’ll pay more for these details and the high-quality plumbing fixtures, but that cost will ensure the remodeled kitchen is not only a joy to use, but a visual treat as well.